The market seemed frozen in anticipation of something. But we understand that neither decline or growth can be permanent and continuous. Therefore, the current state of the market is a correction, while it is more in time than in price. The current correction can be interpreted as “preparation for the jump”, the formation of the next downward impulse, completing the medium-term downward trend in the structure of the general trend. 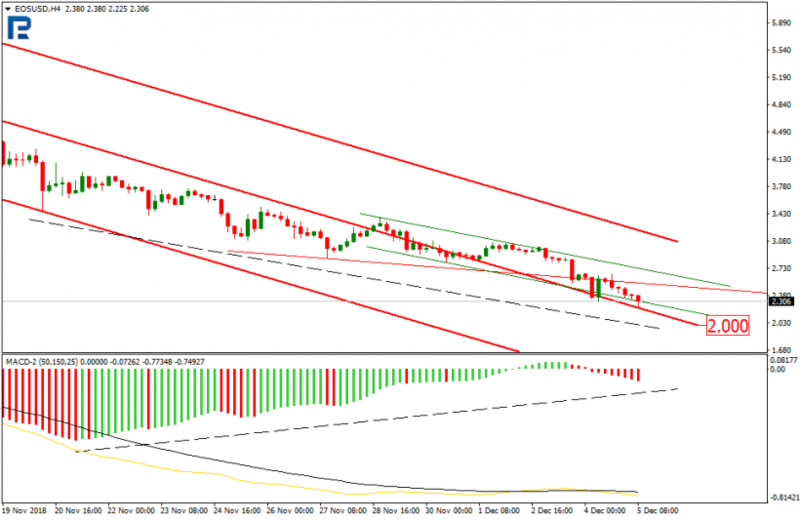 BTC/USD still demonstrates the movement in the descending channel. The reduction targets are on his support line, and one of the main ones is the $ 2,600. Resistance for the long-term trend is located at around $ 5,925. 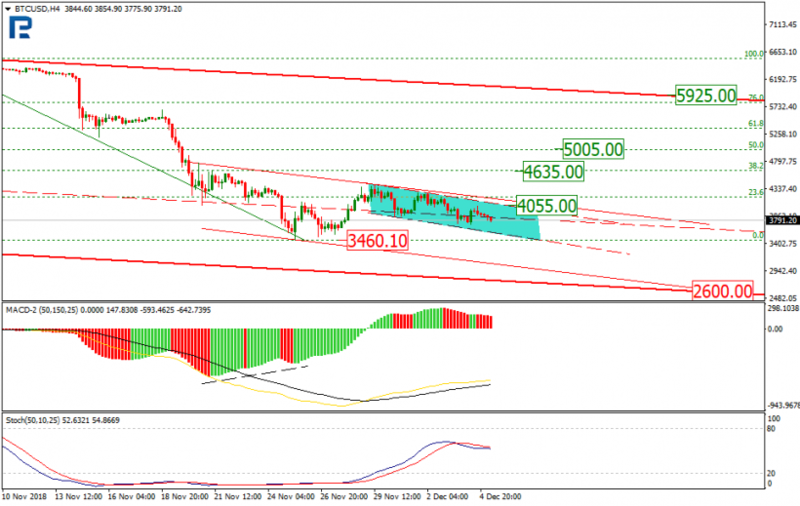 The current situation of price candles in the area of ​​the support line of the internal corridor suggests a consensus of opinion of the bulls and bears regarding the cost of BTC. Breakdown of the main channel support line may allow quotes to go down to the level of $ 1250. On the 4-hour chart, we can observe the development of a decline wave, the primary goal of which is the actual minimum of $ 3460.10. The test of this level can finish with both a breakdown and a rebound, a confirming factor for which may be the upward dynamics of the MACD lines. 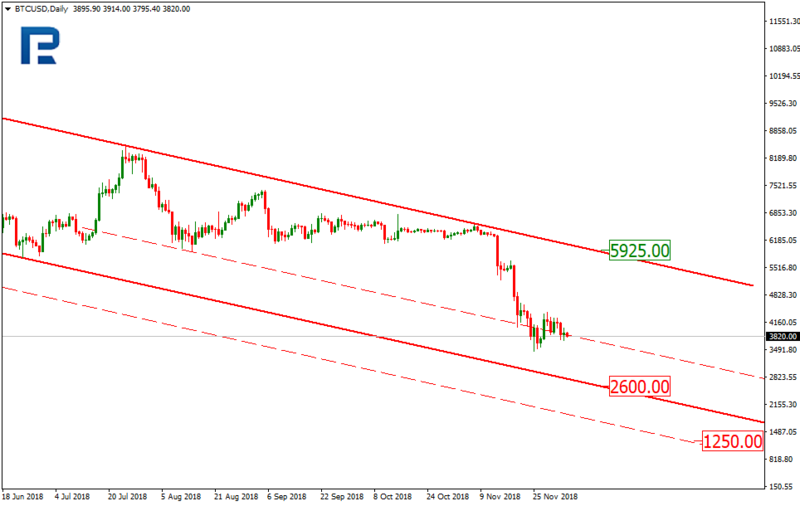 After breaking through the minimum, the impulse is corrected by psychological support of $ 3000, and later to the main one - $ 2600. The rebound, in turn, can reverse into an extension of the correction phase. 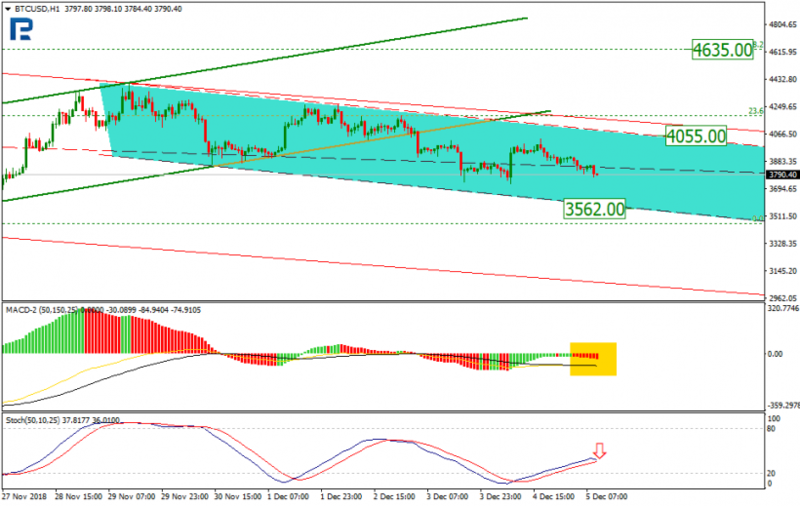 But for the development of such a scenario, the market must first overcome the local resistance at $ 4,055. The targets of the possible expansion of the correctional phase can be the levels of 38.2% (4635) and 50.0% ($ 5005) on the Fibonacci scale. The 1-hour chart of Bitcoin price demonstrates the development of a short-term downtrend within a stable corridor. As a local reduction target, consider its support line and $ 3,562 mark. “Black cross” on Stochastic and the red area of ​​the MACD histogram can be confirming signals in favor of further reduction in the short-term time scale. 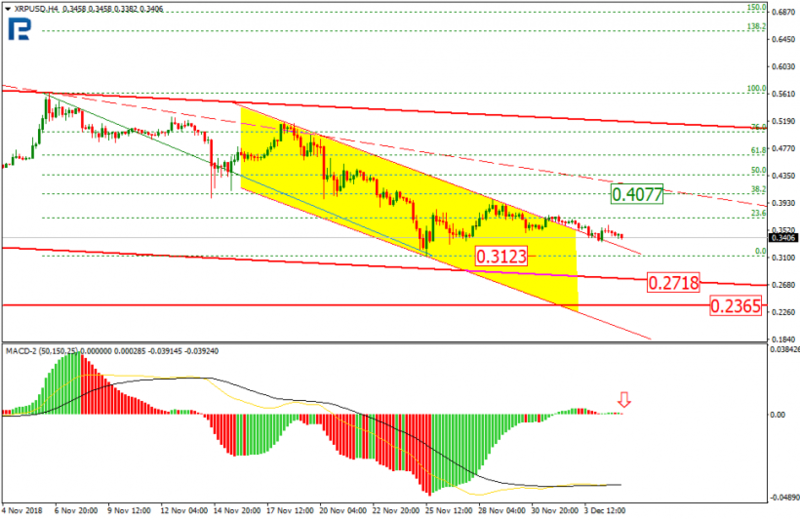 EOS/USD moves to the upper projection channel and continues the development of a long-term downward trend. Currently there is testing support line. The goal of the downward trend is $ 2.00. The current price of EOS can attractive traders for long-term investments. 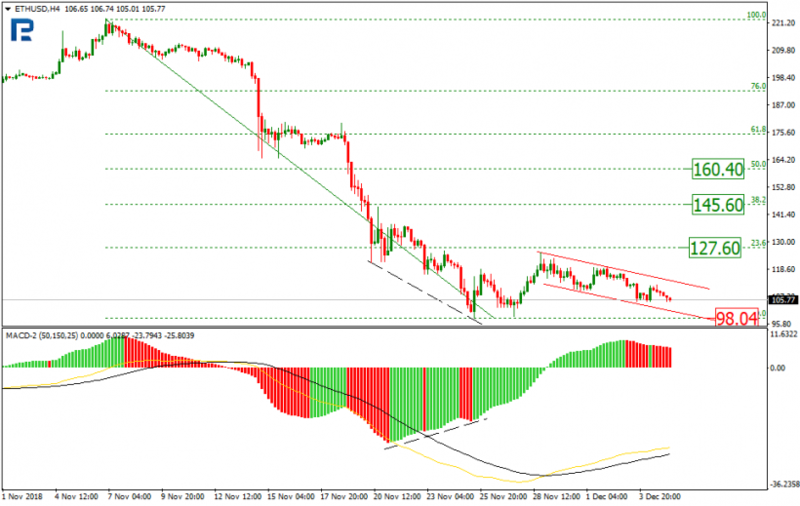 With a developing downtrend on the MACD indicator, we can see the formation of convergence, which may mean an approaching retracement or reversal. 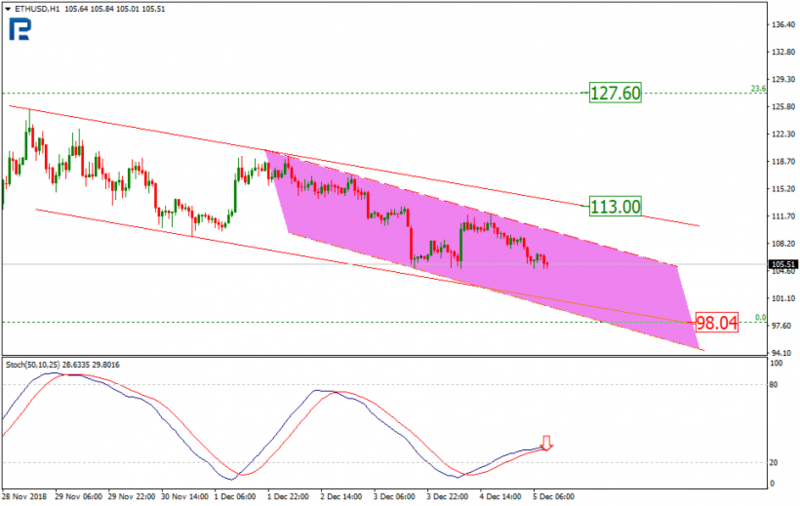 Considering the EOS chart on the 1-hour chart, we can see the development of a short-term downtrend, the target of which is $ 1.85 mark. At the same time, the formation of local convergence is observed on the Stochastic indicator, which may indicate an upcoming correction. Confirmation of the start of the rollback will be a breakdown of the current resistance of $ 2.50. Breakout of this level will open the door to resistance levels of $ 2.67 and $ 3.08. 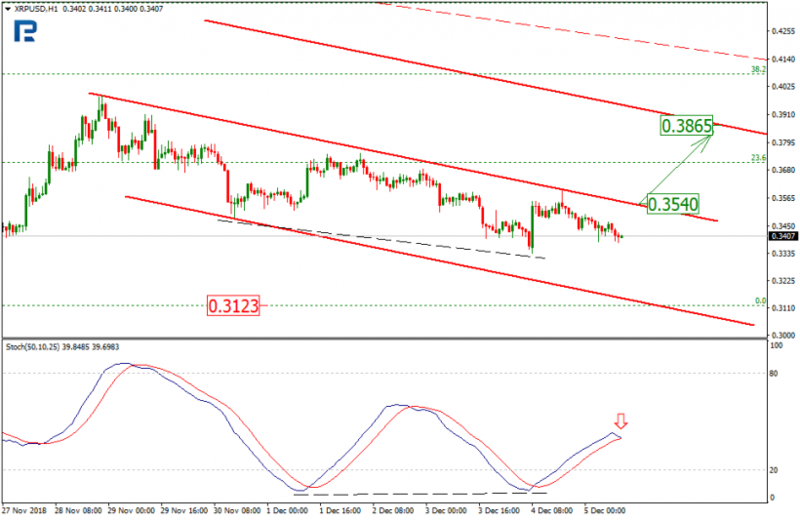 Ethereum dynamics on the 4-hour chart demonstrates a downward wave to the current minimum of $ 98.04. At the same time, the MACD indicator lines are directed upwards. The next growth wave in the correction phase is possible only after the breakdown of the local resistance line. The correction objectives are located at 23.6% ($ 127.26), 38.2% ($ 145.93) and 50.0% ($ 160.62) on the Fibonacci scale. 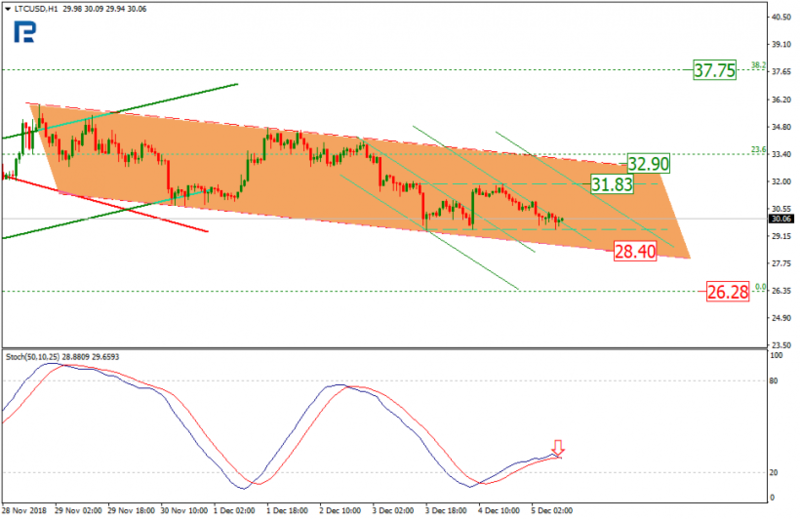 There is a development of the current impulse as part of the downward trend channel on the 1-hour Ethereum chart. The formation of a “black cross” on the Stochastic indicator points to a potential decline to the main local support of $ 98.04. A breakdown of the resistance level of $ 113.00 may be a signal for the development of a short-term uptrend. 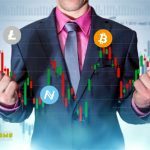 LTC/USD started forming a local downtrend after reaching the Fibonacci correction level of 23.6%. As the immediate goal of reducing should consider the current minimum of $ 26.28. But while the MACD lines are directed upwards, the possibility of continuing and expanding the correction has not been exhausted. The signal for the continuation of the development of the correctional phase will be a breakdown of the local resistance line at $ 32.90. The goal of further corrective growth may be the level of 38.2% ($ 37.75). Litecoin quotes jumped into the upper projection channel. A new impulse to reduce is directed to the support level of $ 28.40. The emerging “black cross” on the Stochastic indicator may be a confirmation of the market's desire to achieve target levels of support. But formation of a local short-term flat is not excludes. In this case, the dynamics of quotations will be clamped between the levels of $ 29.15 and $ 31.83. Estimating the medium-term dynamics of XRP on the 4-hour chart, then it is worth noting that the cryptocurrency continues to decline despite the exit to the upper projection channel. The goal of possible growth will be the current resistance level of $ 0.4077. But the main scenario is still descending. After breaking through the current minimum of 0.3123, the quotes will be sent to levels of $ 0.2718 and $ 0.2365. A confirming factor in the hypothesis of a further decline is the emerging “black cross” on the MACD indicator. Considering the 1-hour XRP chart, we note that after convergence, the quotes corrected the previous downtrend reaching the resistance line. 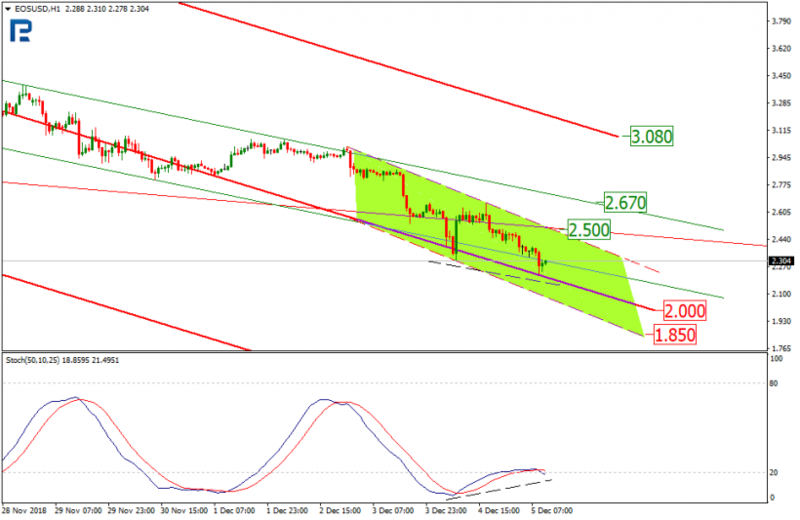 Now there is the formation of another downward impulse in the short-term downward trend. 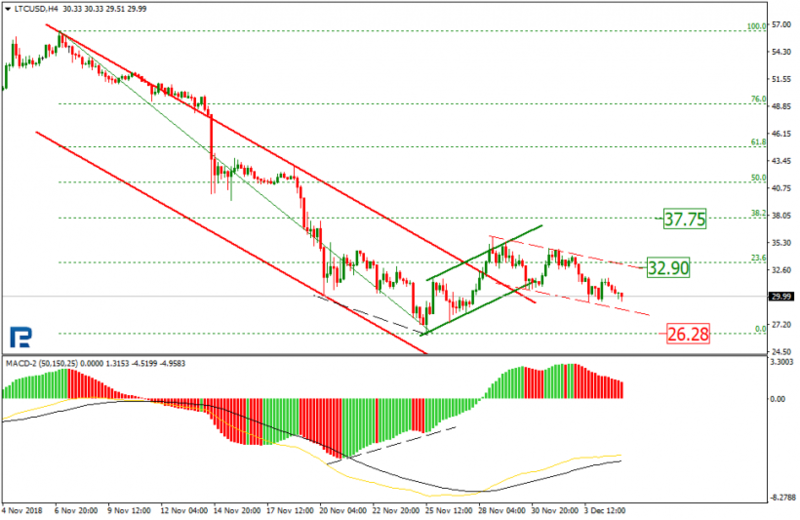 But to exclude the possibility of growth to the resistance level of $ 0.3540, and after the breakdown and to the level of $ 0.3865, it is not worth it. © 2018 bit.news | queries 224, for 0.164 sec.